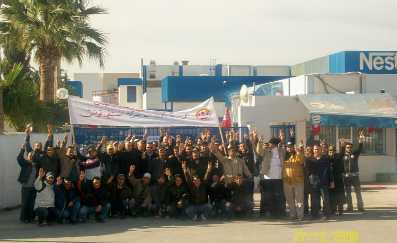 On 17 November 2009, workers at the Nestlé ice cream factory in Carthage were informed by a bulletin board notice that their factory had been sold to a consortium of local companies active in the food industry. "In conformity with its policy of social responsibility," the notice read, "Nestlé has expended all efforts to preserve jobs, the rights of the workers concerned, and maintain the production site." CLICK HERE TO SEND A MESSAGE TO NESTLE! Nestlé's Corporate Business Principles claim to "respect the right of employees to form representative organisations and to join – or not to join – trade unions, provided this right is freely exercised, and establish a constructive dialogue with these unions." Should employees need some guidance on this issue management is there to help. Nestlé Chairman Peter Brabeck has publicly, pointedly threatened to pull the world's largest food company out of Switzerland in response to discussions within the government on legislation to cap executive pay. Interviewed by the weekend Sonntag on September 13, Brabeck said Switzerland "may not be the right location for us", calling legislation on pay "the beginning of the end". The IUF and the Swiss union UNIA organised a joint press conference in the Swiss capital of Bern on 10 July to launch the "Stop Nespressure" campaign in Switzerland and call on Nestlé to Stop the Nespressure and respect fundamental trade union rights!